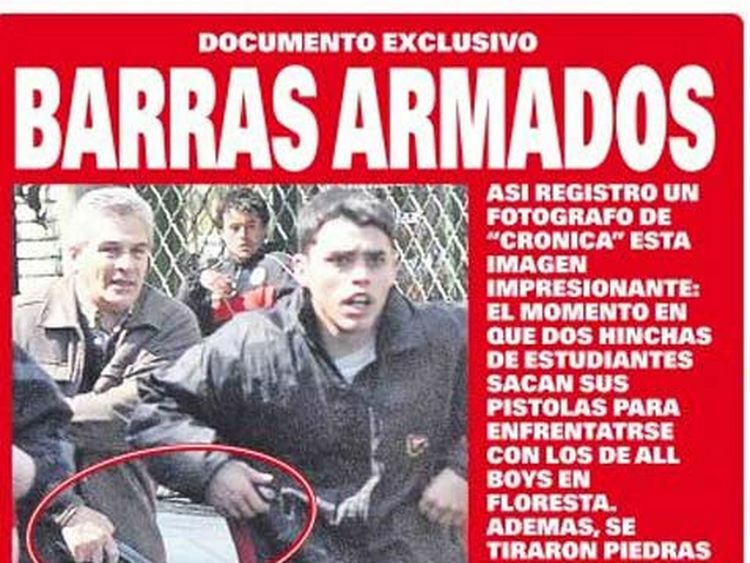 in Only in Argentina und "Futbol"
But dont worry, there were neither injuries nor arrests! These are also, by the way, the same people who last week spent 15 minutes during Independiente – Estudiantes beating the crap out of each other in their own terrace. *Newells Old Boys and Rosario Central are the two first division teams from the city of Rosario, and represent one of Argentinas fiercest, most intense, and most violence prone futbol rivalries. It is within this context that the gravity of the images below needs to be understood. How exactly it happened is still a matter of much discussion, rumors, and disagreement. Some say that the Rosario Central hooligans conducted good intelligence, and so were able to find out the location of NOBs banners and flags. The other version is that a faction of NOB hooligans sold the information to RC hooligans in order to discredit their enemy faction. Whatever the case may be, the most representative NOB flags and banners are now in the possession of their arch rivals, and serious trouble is expected to be ahead in Rosario. At the most recent NOB game the club even went as far as to forbid almost 100 of its own members from entering the stadium, in order to avoid clashes between the rival hooligans groups of NOB. Yes, just like it sounds. The funeral procession for an El Porvenir hooligan (El Porvenir is a small second division club in the south of the province of Buenos Aires) who had passed away was passing in front of the El Porvenir training grounds. Seeing that the players, with who the hooligans dont have the best of relationships, were at practice, the hooligans entered the grounds to „ask“ them to accompany them. The players refused, upon which the hooligans proceeded to threaten them, hit them, steal their belongings, and continue along their way. Incidents during San Lorenzo vs Velez, in San Lorenzo. The Velez fans displayed a provocative banner, making reference to San Lorenzo never having won a Copa Libertadores (basically the south American Champions League). The response from San Lorenzo fans was (mild) incidents inside the stadium, but apparently the worst happened outside, where many a Velez fans tells of being surrounded, not being able to reach their busses, and being hunted across half the neighborhood. *San Lorenzo – Huracan: The bannerless derby! Because Huracan has stolen more banners from San Lorenzo the last few years than they could possibly ever know what to do with, and when they exhibit them during the derby matches the San Lorenzo fans go crazy and the games often end in violent clashes, the Argentine Football Association had for the latest derby a brilliant idea, and yet another great step in the collective punishment of football fans: All flags and banners were forbidden for this match! San Lorenzo, also supposedly one of the „big“ five. But really, how „big“ are you if you got kicked out of your hood because a company bought your stadium and now there is a supermarket on it? Or if you are the only team of the big five whose derby *isnt* against another of the big five? Or if your archrival goes into your clubhouse and steals ALL your banners?! Or if you never won an international tournament? Not very. And Im only not making fun of them for going down to second division because this happened to Racing as well…. Racing has 6 points from 6, best start since 2004, and the stadium is going to be incredibly full tonight. Excitement very. Du browst gerade in den Fire and Flames Weblog-Archiven nach dem Tag 'san-lorenzo'.